Apartment in Villa with pool for 6 people, 3 bedrooms, 2 bathrooms, 2 toilets. Independent apartment in ground garden of a detached villa. The apartment can accommodate up to 6 people with its 3 bedrooms, fitted kitchen and lounge-dining room of 30 m² with a covered terrace. Landscape garden with a swimming pool (9x5) secured and fenced, barbecue area, tennis table, 6 chairs ... Ideally located 1 km from shops and beaches, 3 km from the city center and the beaches of Juan-les-pins. Important note: Family preference. We will not welcome groups of young partygoers to organize parties and parties. Ein Oase 1,5 km außerhalb des Stadtkerns mit sehr netten Vermietern. Gemütliches Haus, toller Pool. Wir haben es zu fünft sehr genossen. Das Haus ist perfekt angelegt und sehr gemütlich. Der Pool ist super und exklusiv für diese Einheit, also Alleinbenützung (auch am Abend). Preis-Leistung sehr ok. Man kann zu Fuß in die Altstadt gehen (20. min), der Bäcker und ein kleiner Supermarkt sind 2 min. ums Eck. Für den Sandstrand braucht man das Auto oder den Bus. Kurzausflüge nach Grasse, Cannes und Nizza waren unkompliziert. Alles sehr nah. Wir danken Familie Massena für eine tolle Woche in Antibes. Et dejligt hus med masser af plads, gode soveværelser og hyggelig stue og køkken. Patioen og haven er hvor man opholder sig og her er godt og afslappende at være. God pool med en dybde så derer plads til sjov. We highly recommend this charming old house for holiday. 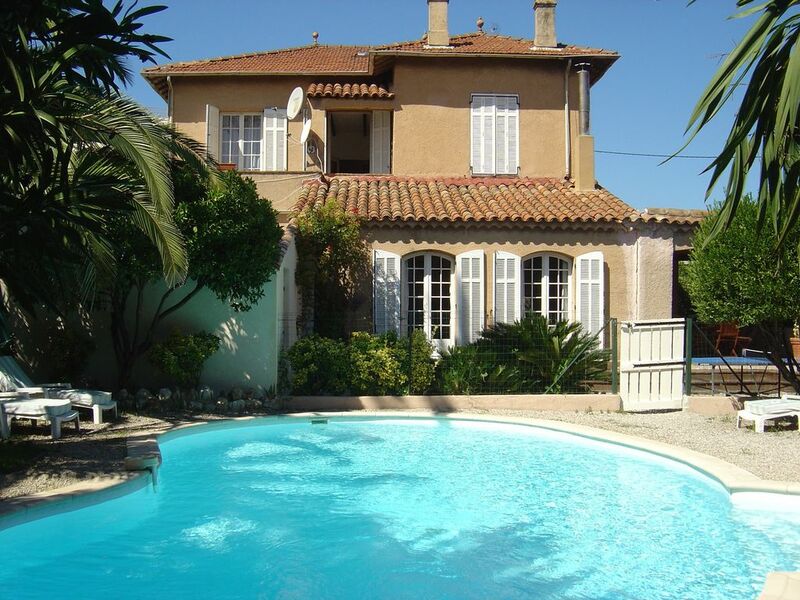 Perfect location nearby the city of Antibes, and Nice. Private garden and swimming pool. 1 min walk to the grocery store. We where 5 people including 3 children at the age of 18, 16 and 10 who had the pleasure to stay her a week in July. The house is well equipped, and was clean and tidy when we arrived. The homeowners was very helpful and reliable. The villa is located 3 km from the city center, the harbor and the old town. The train station and the bus station are a 10 minute walk (1km). Local shops (supermarket and bakery), are 50 meters from the house. There are many bars, restaurants and entertainment in the Old City. Every morning, 'Provencal market' offers the infinite diversity of fresh local produce. Several beaches are within easy walking distance (1km / 3km). The Marineland Water Park is 3 km away where you can enjoy fabulous orca shows, dolphins, sea lions, sharks and polar bears. On the same complex Aquasplash is a water park with more than 2000 m of slip to the delight of the large and small.